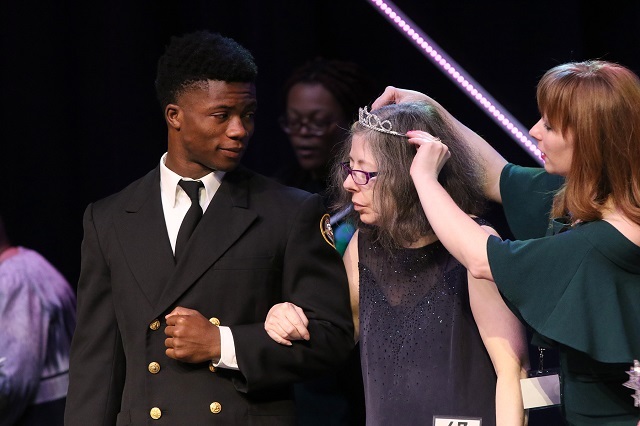 Of the many partnerships that connect Mooseheart students with local communities, none is stronger than the one with Illinois Miss Amazing, an annual event for girls and women with disabilities that takes place in early April at the Yellow Box Community Christian Church in Naperville. That partnership is four years strong and already planned to continue in 2019 and has proven to be as beneficial to Mooseheart’s students as it has been for the Illinois Miss Amazing participants. Nearly 20 Mooseheart students assisted with this year’s show, providing both behind the scenes and on-stage help to make the show special for participants and audience. A number of the school’s cosmetology students helped with makeup and hair prior to the start of this year’s April 7 show. The time constraints and need to do the work correctly put pressure on the students. “Our kids gain so much, and this event is a unique opportunity for our students to use their cosmetology skills and help the participants feel and look beautiful. It’s wonderful to see how excited they are,” Urwiler said. A further group of Mooseheart Naval Junior Reserve Officer’s Training Corps students served as “right-hand men” and escorted participants on-stage. “There is no railing on the edge of our stage, so we truly utilize those students in supporting our participants as they are coming off-stage. Some depend on them greatly,” Harnish said. In addition to the students, a number of Mooseheart staff attends Miss Amazing to chaperone the students and attend the event. “Some of our chaperones have been here every year and they look forward to this as much as the students. They just want to be here because their hearts swell and the children see that as well,” Urwiler said.